Amazon Unveils Its Tablet, The Kindle Fire: Can It Compete? Today, Amazon unveiled the Kindle Fire, a 7-inch tablet that functions like a souped-up e-reader that can also give you access to music, movies, and apps. But questions abound about the device's ability to fit into a crowded market for portable media devices. Amazon Unveils Its Tablet, The Kindle Fire: Can It Compete? Jeff Bezos, Chairman and CEO of Amazon.com, introduces the Kindle Fire at a news conference, Wednesday, Sept. 28, 2011. 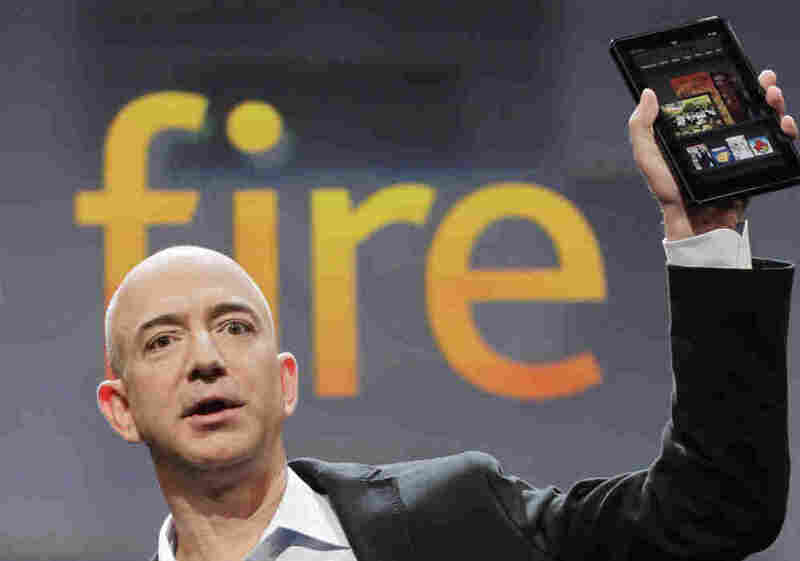 Today, Amazon announced the debut of its 7-inch tablet, the Kindle Fire. Available for $199, the Kindle Fire is being positioned as a device that will deliver Amazon's e-books, MP3s, magazines, web browsing, and streaming video for less than half the price of full-featured tablets like the Apple iPad. The Fire is available for preorder starting today, and will ship November 15. The company also revamped the existing Kindle line which, until today, cost $189 for the basic model if you got it without "special offers" — Amazon's nice way of saying "ads," which come in the form of screens that show up when you're not reading. As fast as Amazon could release the Fire, however, the questions started to arise. A supercharged Kindle or an underpowered iPad? For the Fire to catch on, Amazon probably needs it to be compared in terms of functionality to the existing Kindle, and not to the far more expensive iPad. The Fire can't stand toe-to-toe with the iPad for functionality, cool design, or size, but Amazon hopes to compensate with the much lower price. By selling the Fire for $199 (when rumors had suggested more like $250), they have a chance to position it as a tablet for people who haven't felt like an iPad was essential enough to spend more than $500 to acquire. In fact, NPR's Laura Sydell told me she's been speaking to analysts today who believe the price point can bring people into the tablet market who would never enter it at current Apple prices. One pointed out to her that a person could by a Kindle Fire for herself and an inexpensive Kindle for her kid and still get out of the deal for $300 — $200 less than an iPad. What the Fire probably compares to most directly is Barnes & Noble's Nook Color, which also runs on Android and is rumored to be about to see its second-generation launch. Those comparisons, however, won't be complete until we know more about the Nook Color 2. But Sydell says the Kindle Fire may be making Barnes & Noble more nervous than Apple. Content is key. The big draw of the Kindle Fire is easy access to content bought through Amazon — whether books, music, or video. There are certainly other ways to get content onto the Fire, but Amazon's own offerings will have a lot to do with the device's appeal. Streaming video is still a day-by-day, highly fluid affair in which Netflix suddenly loses its contract with Starz and Amazon suddenly makes a deal with Twentieth Century Fox. If Amazon's streaming video offerings strengthen (right now, they're spotty, much like those at Netflix), it will make an Amazon tablet more attractive, much as the iTunes Store is a selling point for Apple. Does size matter? The Fire is substantially smaller than an iPad — a 7-inch screen instead of 9.7 inches. For users who really value the larger screen and see it as the biggest single advantage of a tablet over a smartphone that can, after all, do many of the same things, the reduced size may be a problem. On the other hand, the fact that the iPad couldn't be held in one hand and weighed substantially more than a Kindle wasn't an advantage to Kindle users who liked to read while hanging on to, say, a subway pole. Is it too soon? The first Kindle Fire doesn't have 3G wireless capability, only WiFi. Even existing regular Kindles have 3G, and it seems highly unlikely that the long-term plan at Amazon is not to offer 3G. That's only one of a variety of factors that lends some credence to fears that this initial Fire is a "stopgap" device until they get around to launching the real one. Cloud storage. Rather than offering a robust amount of memory on the Fire (it has only 8 gigabytes) Amazon is betting on cloud storage — which is how the Kindle operates with e-books. Your movies and TV shows will be stored "in the cloud" on Amazon's servers, and you'll keep them on your device when you're using them. Cloud storage has its advantages: You don't need the same amount of memory, you can put things on a new device if you lose your old one, and so forth. But it also has its detractors: People who want to own their content and have access to a free and clear copy of it are never excited about cloud storage, which stresses the fact that you could lose access to your stuff if you lose access to that "cloud" for whatever reason. It also leaves you open to things like Amazon's infamous pulling back of an edition of Animal Farm it discovered it didn't have the legal right to sell. That kind of thing — having a book remotely removed from your reader — makes people incredibly nervous. The advantage of Amazon's cloud may actually come in its servers, which are being used to run the new Silk browser. As Laura Sydell explained it to me, rather than having your browser do all of its dealings directly with whatever web site you're visiting, using Silk will call upon Amazon's servers to do the heavy lifting, which may make the browser much faster. Android issues. The Kindle Fire runs on a version of Android, the same software that runs countless smartphones that don't happen to be made by Apple. But the version of Android is one specific to Amazon, rather than a standard version. While Fire users will be able to download Android apps from Amazon's Appstore, there will be worries about whether all Android apps will work the way they should on this particular version, now and in the future. Farewell to e-ink. One of the things that many Kindle users like about their Kindles is that it has a grayscale e-ink display, rather than a backlit screen like smartphones and computers have. (The disadvantage, of course, is that it can't be read in the dark without an external light source.) The Fire will — typically for a tablet — have a backlit screen and not e-ink. On an existing Kindle, the display looks surprisingly like a paper page; here, it will look like reading on a computer screen. Kindle enthusiasts may not uniformly embrace that backlit display. And, Sydell reminds me, you may not want to take the fancy tablet and its glass screen to the beach. An old-school Kindle will look better in the sun. The bottom line. All of this is just getting started. Once more people have seen and touched and reviewed the Fire, it will be easier to know what its prospects are. But for now, Amazon is trying to reach for the space between e-readers and more robust tablets while, at the same time, making it cheaper for people who want reading only. Tune into All Things Considered tonight for additional coverage of the Kindle Fire from NPR's Laura Sydell and Margot Adler.